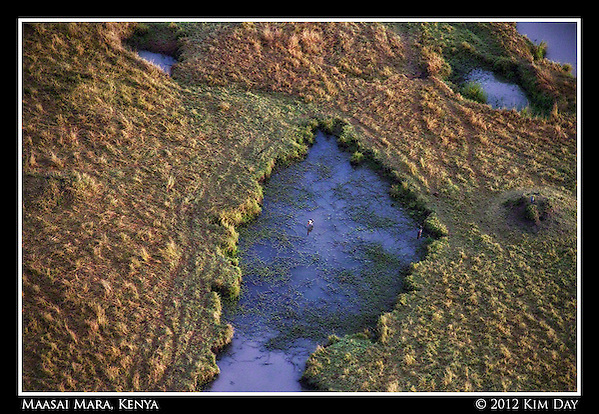 Darkness and an early morning chill cloaked the savannah when the legion of Land Rovers set out for an early morning adventure. 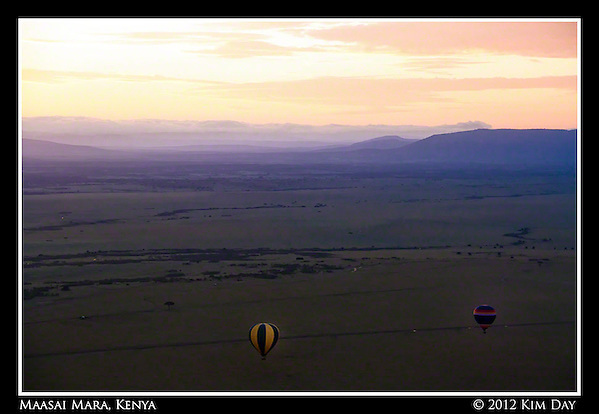 We jolted our way along winding dirt roads to the hot air balloon launch site. The “Blue Hour” was just beginning as we checked-in and listened to the pilot briefing. 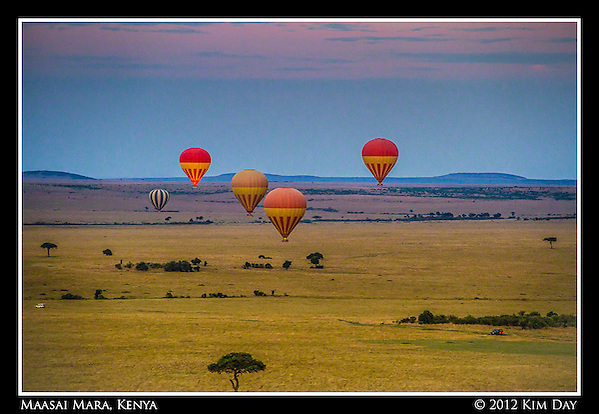 The sky began to lighten as my group of 12 made our way over to the waiting balloons. 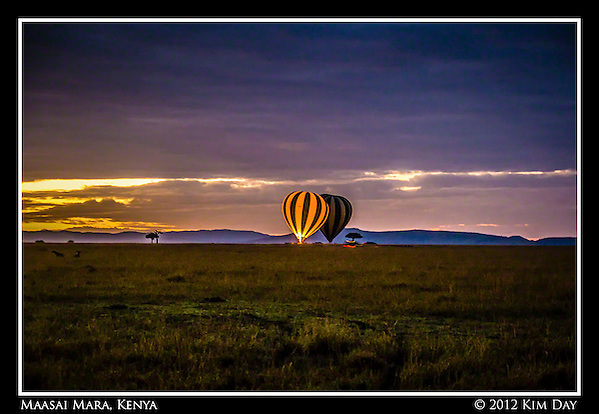 In the distance other balloons were preparing to lift off. 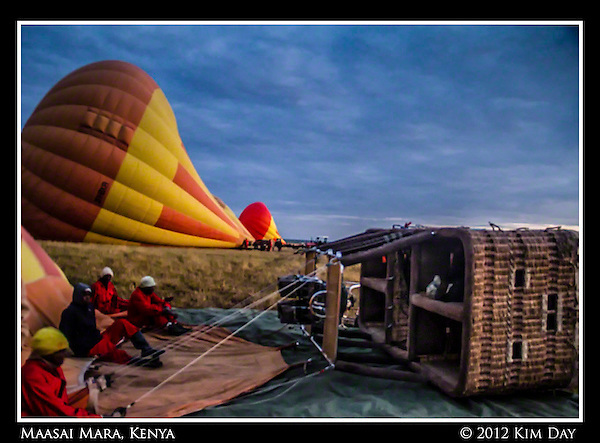 Our balloon basket was laying on its side in front of our partially filled balloon. Divided into four small compartments, with the pilot in the center, three of us had to wiggle into each compartment while it lay on its slide so that we were laying on our backs, looking up at the sky. 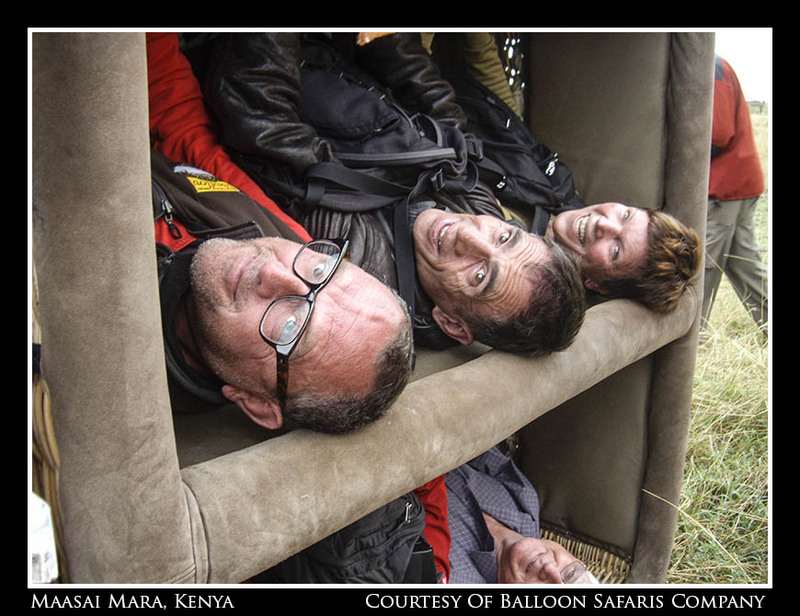 Once everyone was shoehorned into their little compartment, the launch team got us ready for take off. 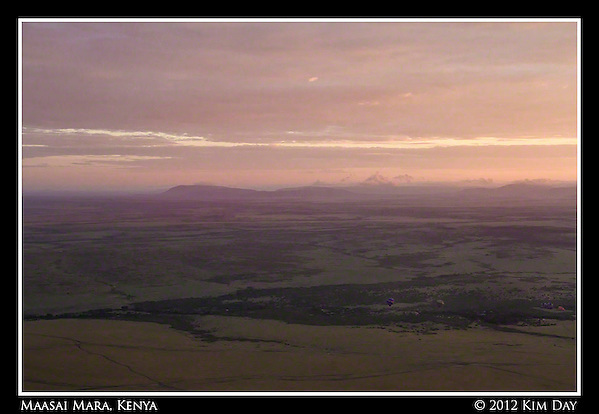 We were treated to amazing views of the sunrise over the Maasai Mara after we got up into the air. 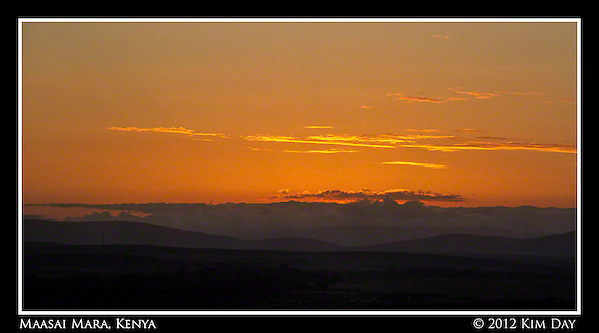 As the sun rose higher into the sky, the landscape became more distinct. 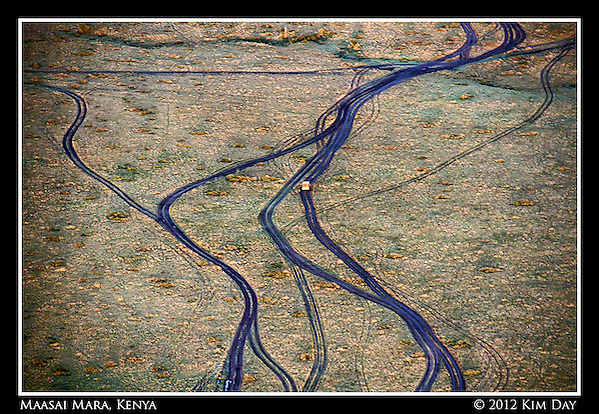 Safari vehicles started to creep down criss-crossed trails wet from the previous nights rain. 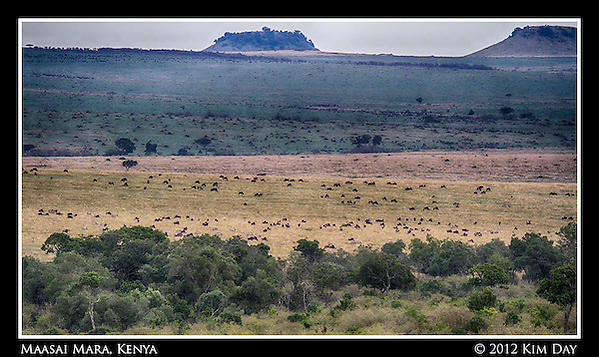 … to herds of wildebeests that dotted the land as far as the eye could see. 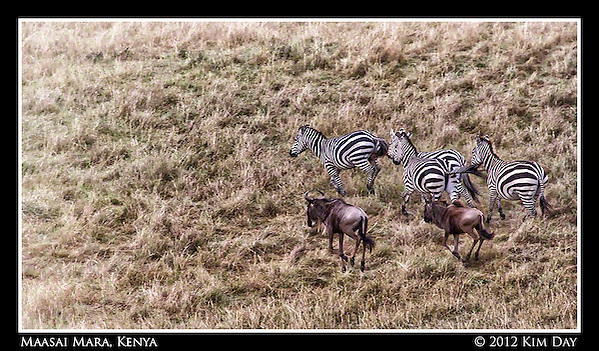 We saw zebra and wildebeests running across the ground beneath us. We also had a group shot taken from a camera tied to the balloon (I’m to the far right). We drift through the skies for over an hour. 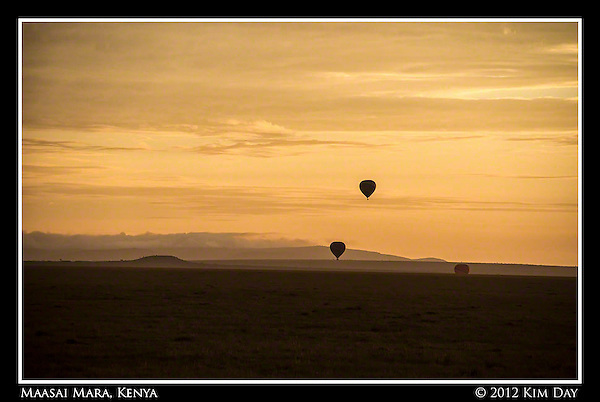 As we neared the end, we saw other balloons setting down to head for the champagne breakfast. 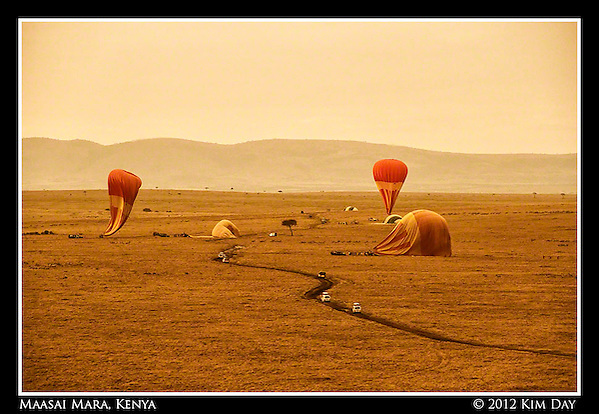 And Land Rovers started to chase our balloon to our landing site so we could get to our own champagne breakfast. 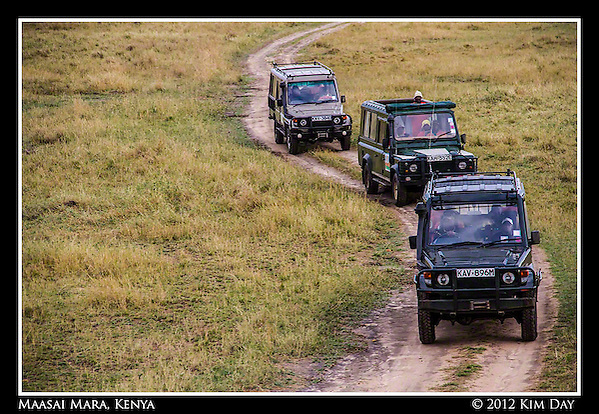 A horde of about 80 Chinese tourists made it to the picnic site before us (in fact they snapped up all of the balloons except ours that morning) and this line of vehicles was waiting to take them back to the lodge when we arrived. 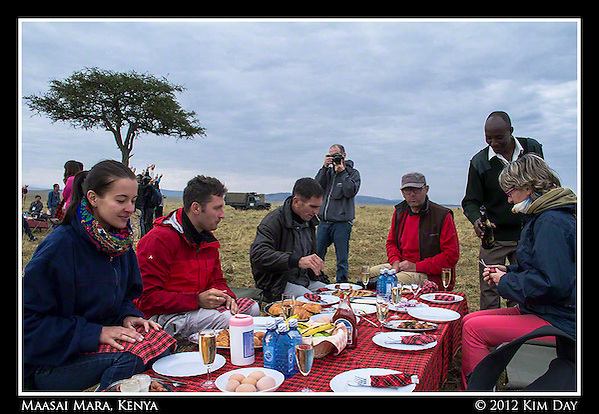 Our group picnicked on quiches, fruits, and fresh pastries and an unending supply of champagne. 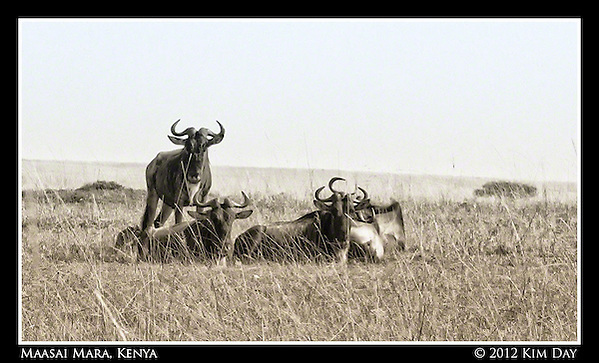 After breakfast, we enjoyed a game drive en route to the lodge. 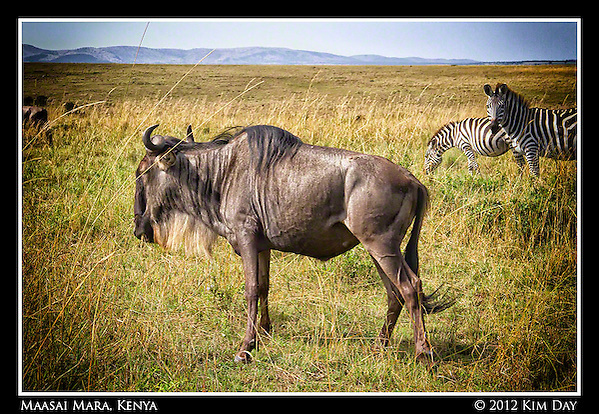 We were lucky enough to see the lions I shared in a previous post as well as have some up close views of wildebeest and zebra below. 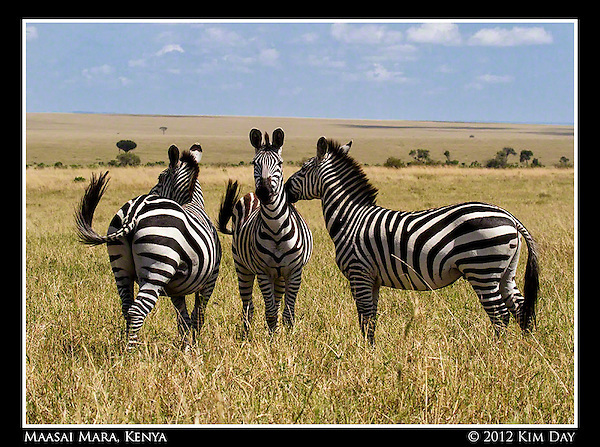 When zebra stand beside each other, you’ll notice that the ones next to each other typically will face in opposite directions. This is so that they can keep an eye out for predators. 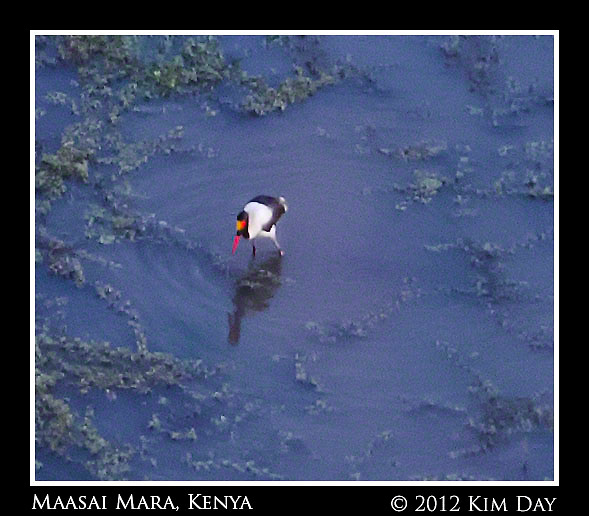 This entry was posted on Thursday, October 4th, 2012 at 3:00 PM. 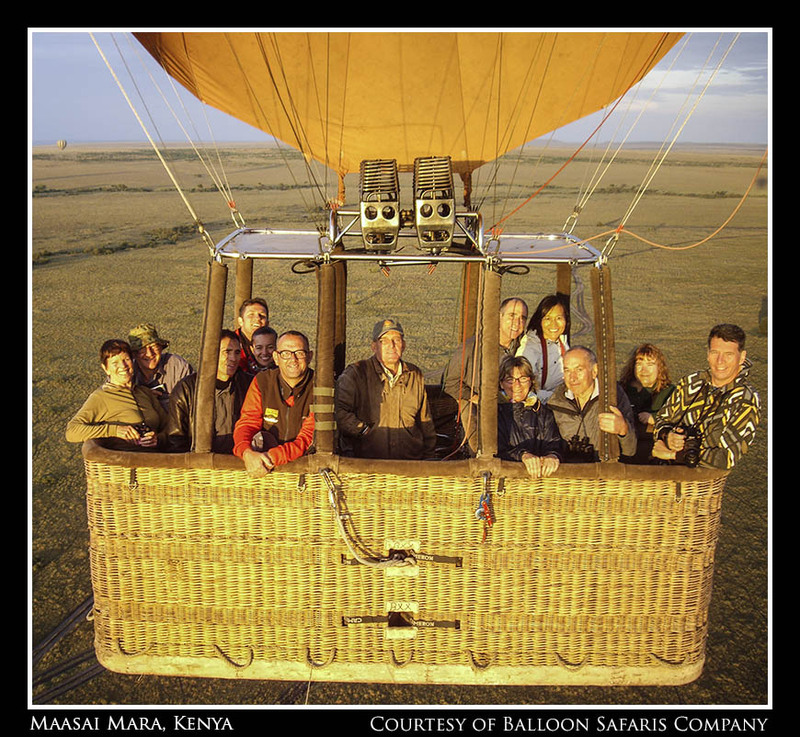 It is filed under Globetrotting: Near and Far, Kenya and tagged with african sunrise, Balloon Safaris LTD, champagne breakfast, game trails, hot air balloons, saddle billed stork, sunrise, water holes, wildebeests, zebra. You can follow any responses to this entry through the RSS 2.0 feed. 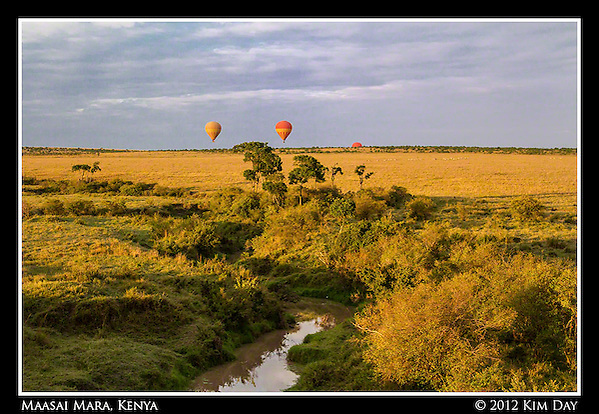 WoW!The Hot Air Balloon pics are AMAZING. 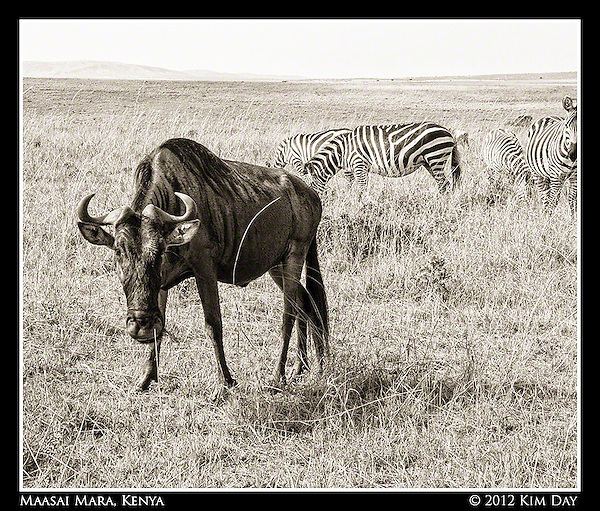 I can’t believe you got in that basket…you are truly and adventurous girl! The 8th picture captioned “distinct landscape” is my favorite.